In his first guest post for Corporate Jet Investor, Alud Davies aka BizJetBlogger rounds-up the top 10 private jets, looking at the most stylish. This is why the vast majority of business jet colour scheme can be described as boring at best (after all, if you can’t identify who owns an aircraft, there’s little hope of knowing who’s likely to be on board). But some companies and individuals like to buck this trend. They like to stand out from the crowd and let you know exactly who they are, so below we’ll take a look at some of the more colourful business jets around. Nike’s earlier acquisition this year was a brand new Gulfstream 650, although the Nike flight department operate this on behalf of co-owner Phil Knight. This distinctive scheme is different on either side of the aircraft, with one side showing a pictorial representation of Nike, the Greek Goddess of Victory, and the opposite side being a stylisation of the Oregon Ducks college football team’s helmet. The undersides of the wings have been painted with feathers, and each of the wingtips is painted with the signature Nike ‘swoosh’, but the ultimate customisation has to be the tail number: N1KE. Prada are synonymous with the colour black, so it came as no surprise when a Gulfstream 450 business jet (msn 4279 / I-XPRA) was delivered to the company in a gorgeous overall matt black scheme. My personal favourite of all of the schemes here stands out wherever the aircraft flies. With Italy known for fashion and style it shouldn’t come as much of a surprise to see another Italian registered aircraft making the list. Sirio SpA took delivery of a Gulfstream 550 (msn 5314 / I-ADVD) during the summer of 2011 and its distinctive overall silver colour stylishly matched with yellow and black stripes has been brightening up airports in Europe and the rest of the world ever since. 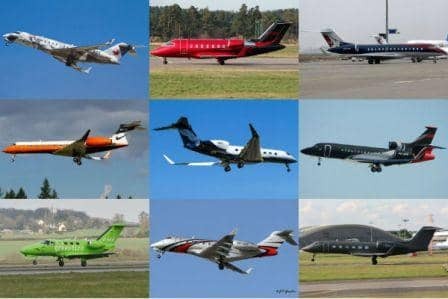 One person that clearly doesn’t mind standing out from the rest is Formula One racing driver Lewis Hamilton, who took delivery of a Bombardier Challenger 605 (msn 5904 / G-LCDH) business jet in January 2013. With its overall red and black colours the aircraft also carries a personalised tail number, with G-LCDH representing Lewis Carl Davidson Hamilton. Captured departing Montreal on its delivery flight, this Challenger 300 takes the theme of using black, red and silver together in a scheme, but swaps the usual order by using silver as the predominant colour. The addition of the red and black flashes make this Challenger 300 really stand out.